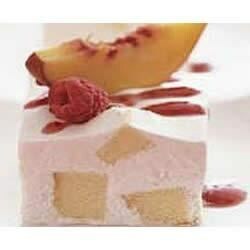 "Pound cake cubes are blended into an ice cream mixture, frozen, and served with fresh peach slices and raspberries." Stir whipped topping, ice cream and dry gelatin in large bowl until well blended. Stir in cake cubes. Spoon into 8-inch square pan. Drizzle with raspberry preserves. Cut into squares. Top each square with 1 peach slice and 1 raspberry. Store leftover dessert in freezer. Substitute: Prepare as directed, using COOL WHIP LITE Whipped Topping, low-fat ice cream, JELL-O Brand Peach Sugar Free Low Calorie Gelatin and reduced fat pound cake. How to Thaw COOL WHIP: Place unopened 8 oz. tub in refrigerator for 4 hours. Do not thaw in microwave.